During the time I've been away from Singapore, a spate of All-Day Breakfast cafes have been springing up- such as Hatched, Strictly Pancakes and Wild Honey. While this concept is nothing new in Perth (where I live most of the time), it seems that this craze has caught the attention of many Singaporeans, in particular the yuppie and twenty-something crowd. Wild Honey is an all-breakfast cafe located on the third floor of Mandarin Gallery: be warned, they have a no-reservation policy so be prepared to wait. Some reviews I've read of this place have mentioned up to 1.5 hour waits during busy periods (I only had to wait 10 minutes, yay!). The interior of the cafe is vintage-styled and filled with sofas set around small circular tables. Dim lighting and plump cushions complete the look, lending the cafe a distinctive coziness. 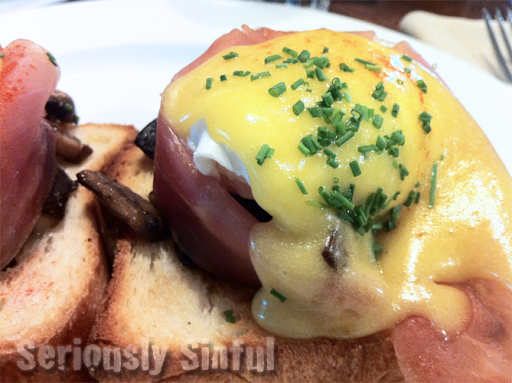 I ordered the European Breakfast ($18), which is Wild Honey's interpretation of Eggs Benedict (I did mention that I'm a fan of Eggs Benedict in my earlier post, didn't I?). I have to admit I found the price rather steep for Breakfast ($18 for breakfast, really!? And this is coming from me, living in Perth!). I also ordered an Iced Coffee and my breakfast partner decided on the English Breakfast ($22) with OJ. 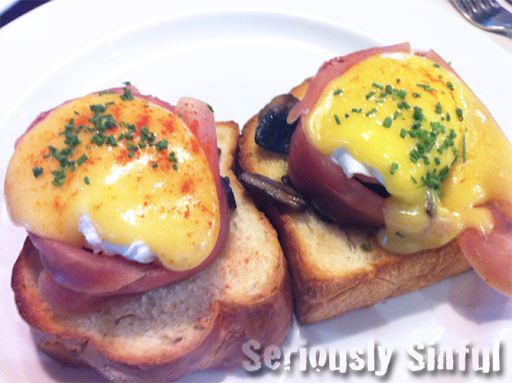 The Eggs Benedict was made of sautéed mushrooms and poached eggs wrapped in prosciutto (cured uncooked ham) that sat on toasted brioche, topped with hollandaise sauce. The eggs were poached to perfection and unlike Aussie poached eggs, they didn't literally explode when you cut into them (always a positive to remain a neat eater). The proscuitto added a smoky savory taste that went very well with the brioche, eggs and hollandaise sauce in my opinion (this is a first having Eggs Benedict with brioche, but I quite enjoyed it!). Although I loved the mushrooms, I felt that they didn't add much to the dish. Fresh spinach(!!) would have been a much better option, so I thought. I also have to say that I was rather disappointed with the Iced Coffee ($7). It was mediocre and like most places in Singapore, I was literally served with a glass of black Coffee with ice and sugar syrup. Where is my iced-latte style coffee?! For $7 I would have expected something like that at the very least. My friend ordered the English breakfast, which he swears is Legendary. Apparently he's already tried it but simply NEEDED to have it again after seeing the menu (which is on an iPad). 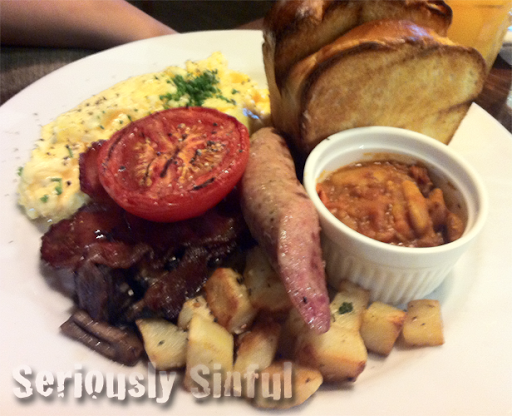 The breakfast classic contains scrambled eggs, sausages, sautéed mushrooms, baked beans, fried bacon, tomato, a side of potatoes and toast. He didn't want to eat his tomato so I did the honors - and boy, was that tomato fresh. BEST TOMATO EVER (and I don't normally like tomatoes). While I still think that Wild Honey is overpriced, I might return - if only to try their Tunisian or Mexican breakfast.